This post is part of my series on How to Shape Children’s Behavior. “Say it!” you insist, an edge of warning in your voice. “Say it like you mean it,” you demand. “Sorrrrry,” he repeats, dragging out the word slowly with bulging eyes and dripping insincerity. “iforgiveyou…” he mutters, looking down to the side dejectedly. This scenario might sound all too familiar– if not from your experiences as a parent, then at least your own experiences as a child. It’s easy to see how it isn’t always that effective. You, the teacher/parent/authority, probably benefit from it the most because now at least you can feel like you did something about it, allowing you to close the case. Problem solved… now stop bickering. You know inside, however, that the offended still feels bitter, because the apology was not sincere. And while it may seem like the offender got off easy– not even having to show proper remorse or use a sincere tone–he is actually the one who loses out the most. He not only learns a poor lesson that he can get away with lies and empty words, but does not have the opportunity to experience true reconciliation and restoration of relationships. He will probably continue inflicting similar offenses, feel less remorse than he should, and undergo less positive character change than he could have. But what alternative do you have? What else are you supposed to do? It’s not like you can force a genuine apology and repentant heart out of him, right? 1) I’m sorry for…: Be specific. Show the person you’re apologizing to that you really understand what they are upset about. Wrong: I’m sorry for being mean. Right: I’m sorry for saying that nobody wants to be your friend. 2) This is wrong because…:This might take some more thinking, but this is one of the most important parts. Until you understand why it was wrong or how it hurt someone’s feelings, it’s unlikely you will change. This is also important to show the person you hurt that you really understand how they feel. I can’t tell you how much of a difference this makes! Sometimes, people want to feel understood more than they want an apology. Sometimes just showing understanding– even without an apology– is enough to make them feel better! Wrong: This is wrong because I got in trouble. Right: This is wrong because it hurt your feelings and made you feel bad about yourself. 3) In the future, I will…:Use positive language, and tell me what you WILL do, not what you won’t do. Wrong: In the future, I will not say that. Right: In the future, I will keep unkind words in my head. Now let’s practice using positive language. It’s hard at first, but you’ll get better. Can anyone think of a positive way to change these incorrect statements? Wrong: In the future, I won’t cut. Wrong: In the future, I won’t push. Wrong: In the future, I won’t take your eraser. 4) Will you forgive me? This is important to try to restore your friendship. Now, there is no rule that the other person has to forgive you. Sometimes, they won’t. That’s their decision. Hopefully, you will all try to be the kind of friends who will forgive easily, but that’s not something you automatically get just because you apologized. But you should at least ask for it. As a teacher, I know that asking for forgiveness puts the offender in an uncomfortable and vulnerable place of humility. However, this seemingly obvious yet widely underused phrase is very, very powerful for both the offender and the offended. It is the key to reconciliation and often the first step in restoring friendship. I also know that the second item, “This is wrong because…” is powerful in changing the longer-term behavior of the offending child. Forcing the child to put themselves in another’s shoes will increase empathy and help them understand better how they have hurt someone else. This exercise in trying to see themselves from someone else’s perspective can be very powerful. After this talk, I had some volunteers come to the front to role-play some apologies. We paused at various points and reflected on how to improve the apology: was the body language sincere? Did the apologizer really capture how the other person felt? Sometimes, I would whisper instructions to one student to roll his eyes, look away, mumble, or phrase something a certain way. The students treated it like a game, trying to spot what was amiss in the apology. This was very effective, because when the time eventually came for real apologies, everyone knew we were all going by the same rules, and the expectation was set for a sincere, thorough apology. 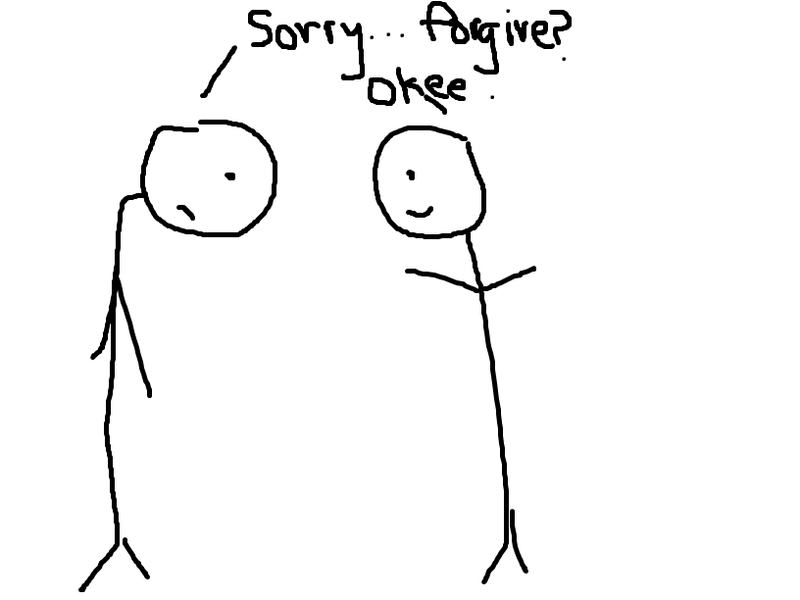 When I first tried out this “new” old-fashioned apology with my students, I didn’t expect any long-lasting results. I just wanted to see what would happen. But what happened in the weeks and months following simply blew me away. It started with our weekly Friday afternoon class meetings. We already had a good thing going here, with the kids “throwing” kudos to each other with compliments and appreciations: “I’d like to give a kudo to John for asking me to play with him at recess,” or “I’d like to give a kudo to Kylie for working really hard on her writing this week!” It was cute, and students enjoyed both giving and receiving the kudos. One week, I decided to review our apology lesson, and then asked the students if anyone needed to “clean-up” something that happened this week with an apology to someone in the classroom. When I asked, I meant for any volunteers to take their business outside. My first volunteer, however, started apologizing to her friend right there on the spot in front of the whole class. Before I could stop her, she began blubbering through her apology, reciting each line like she’d planned this for days. Maybe she had. I could see the relief on her face when her friend accepted her apology. The girls smiled shyly and I knew we were onto something good. Before I knew it, students were raising their hands left and right, eager to make amends with people they had offended. Some of the “offended” people hadn’t even realized that they had ever been wronged, but happily forgave anyway. Then a boy raised his hand. A boy most of the kids did not like for all the usual reasons– he was bossy and rude and generally unpleasant to be around. He apologized to the whole class for being really, really annoying and stated his plans to change. I was among the many individuals exchanging puzzled but impressed glances, and indeed it was one big step in this child’s personal growth. It was especially heartwarming to see how his classmates interacted with him afterward. They really wanted to give him a second chance, and they sincerely tried to help him be his best. I’m sure it wasn’t easy for him to admit to the class that he was annoying, but it was a powerful first step in changing his relationships with everyone. While not perfect, his behavior improved greatly after this event and I am glad I gave him the tools and space to “reset” this way. As you can imagine, this meeting took much longer than usual. In the weeks that followed, I had students take their apologies outside and every week, there were takers. Students relished in the opportunity to admit wrongdoing, share intent to change, and restore friendships. It was a beautiful, beautiful thing. They walked out stiff and uneasy, and returned with bright smiles on their faces. “…because you’re upset?” he offered. “…because I’m not learning?” he asked. “And because…” he glanced down nervously. Yeah, I can be pretty tough on them sometimes. Tough love. The students nodded their heads and we resumed our lesson. No one missed a beat the rest of the day. The next time it happened, weeks later, the offending student was quick to apologize, articulating how her inattention affected herself and her classmates, and was quick to change. It was no longer a matter of embarrassment or shame, but simply acknowledging 1) what went wrong, 2) who was affected, 3) how to change, and 4) asking forgiveness. I couldn’t believe how much more focused all of my students were once we began these apologies for not paying attention! It was astoundingly more effective than giving them individual warnings. I think it had something to do with feeling beholden to the entire class. Either way, win for me, and win for them. One day, my principal came to inform me that a couple of my students had gotten in a fight with some other kids during lunch. 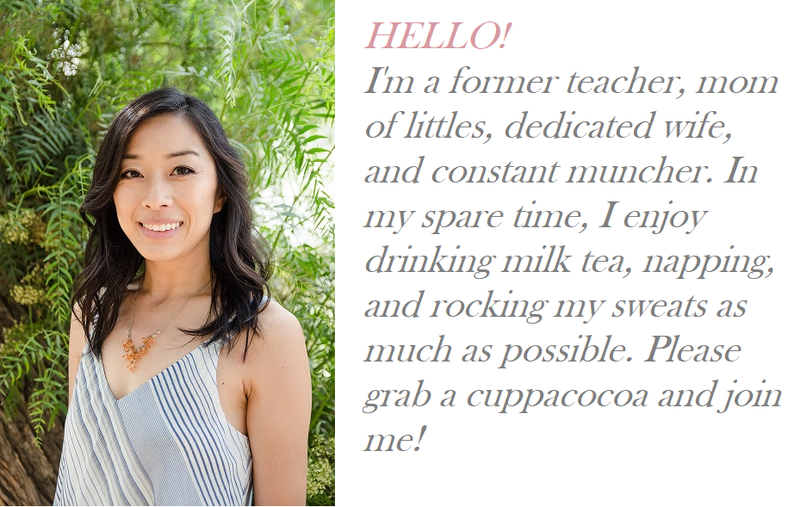 I started to let out a discouraged sigh when she continued to share with me how impressed she was with my students. Impressed? Turns out one of them quickly offered a thorough, 4-step apology. Immediately after, my other student also apologized for his part. She was totally floored by their responses, and wanted to find me to tell me what happened. While I was not that surprised that they were so good at apologizing (there tend to be a handful of children who get more practice than the rest…), I could not have been more proud! These real, meaningful apologies had made their way out of my classroom, onto the playground, and into the principal’s office! Maybe, just maybe, they would bring it into other spaces in their lives. A teacher can hope. 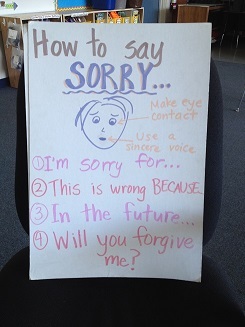 I’m not sure if my students carry this formal apology home, or if they even remember it in fifth grade. But I know it works, and I know I’ll be teaching it to my own children someday. Try it on your own kids sometime…you won’t be sorry! Update: Have a kid who needs to say sorry more often than you’d like? Let’s do one better and prevent the problem in the first place! This post is the first in my series on How to Shape Children’s Behavior. Thanks for reading!